Thanks to Dr. Nikhil Sangle, London Health Sciences Centre and St. Joseph's Health Care (Canada) for contributing this case and the discussion. To contribute a Case of the Week, follow the guidelines on our main Case of the Week page. (1) Last week, we posted another article on our Management page: "Revenue Changes For Health Care In 2016...So Far", by Mick Raich, Vachette Pathology. We currently post new articles that are provided by Vachette Pathology and AdvantEdge Healthcare Solutions. The next article will be available to view towards the beginning of August. In addition, take a look at the New Product Announcements we posted recently for Mopec and Ventana / Roche. 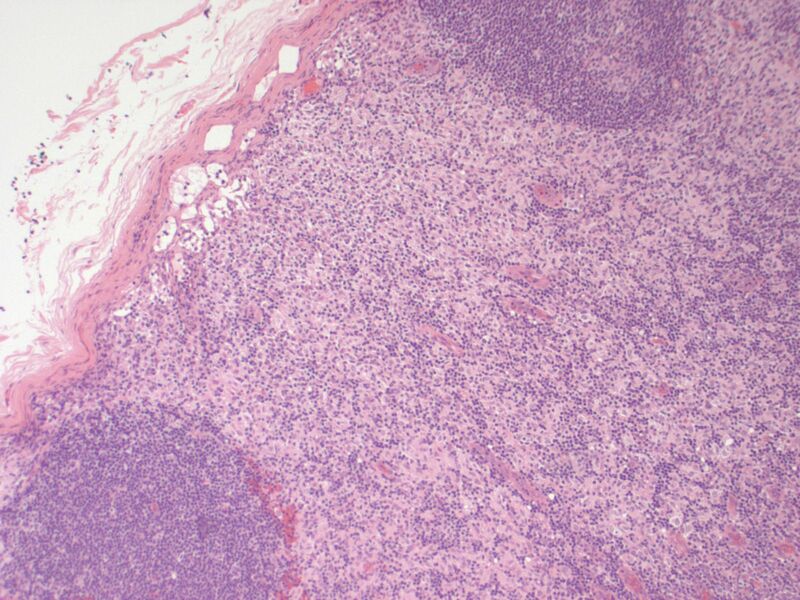 (2) We are now allowing Pathologists to submit interesting cases on our Facebook page, for comments by other pathologists. This should not replace a formal consult necessary for making a patient diagnosis. Please post up to 100 words of text and 3-5 images on our Facebook page. Comments must be relevant, polite and not offensive. We monitor this page, and remove posts / comments that don't meet these standards. 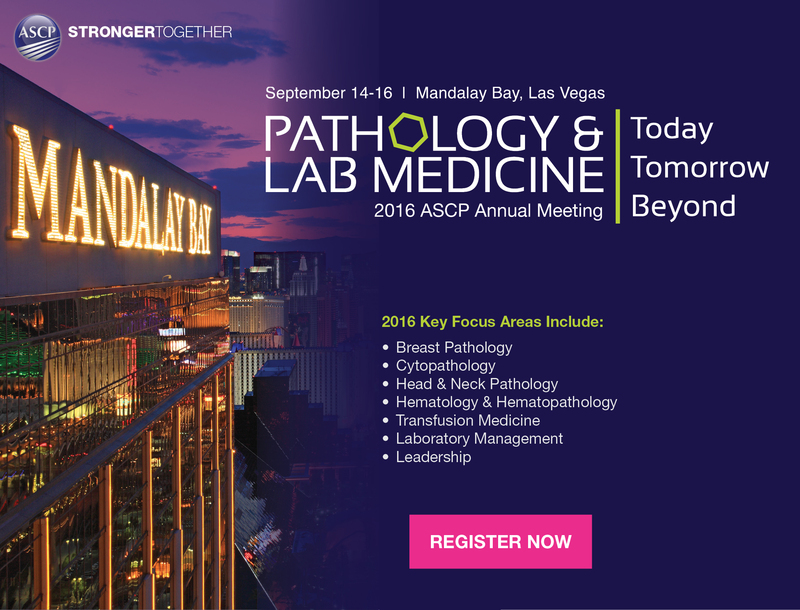 (3) What do you think: should we have a page for classified ads (buying and selling expensive pathology related equipment) at PathologyOutlines.com? We would charge $400 for an ad (prepaid only, perhaps a little less at the beginning), which could include 100 words and 3 images. Buyers / sellers would communicate with each other directly. We would do nothing other than post the ad and remove it after 90 days (or sooner, if requested by the seller). We could either create a separate Classifieds page on our website, or put this on our Facebook page. Is this a good idea / bad idea? Let us know. A 37 year old woman presented with a 1.1 cm solitary non-tender axillary lymph node, which was excised. 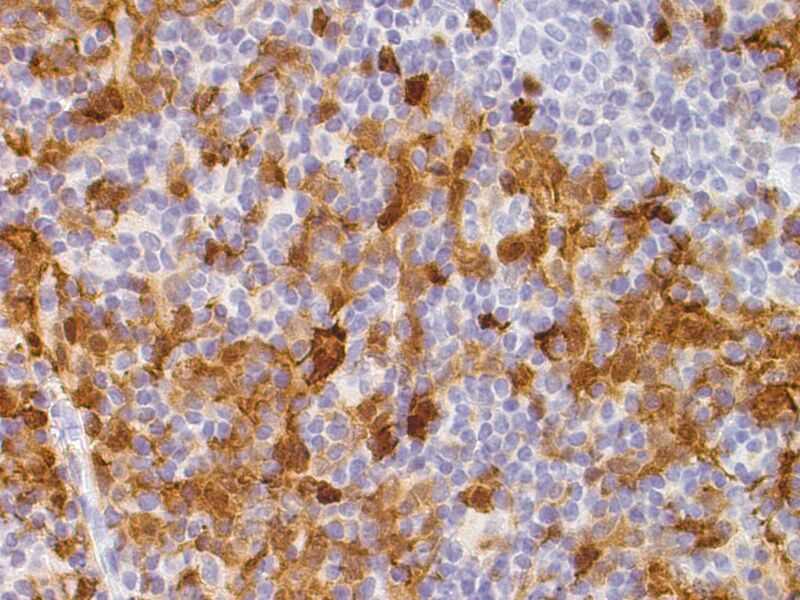 Immunohistochemistry: CD3 and CD20 demonstrate a normal proportion and distribution of T and B lymphocytes respectively. S100 and CD1a confirm an expanded population of interdigitating dendritic cells and Langerhans cells. 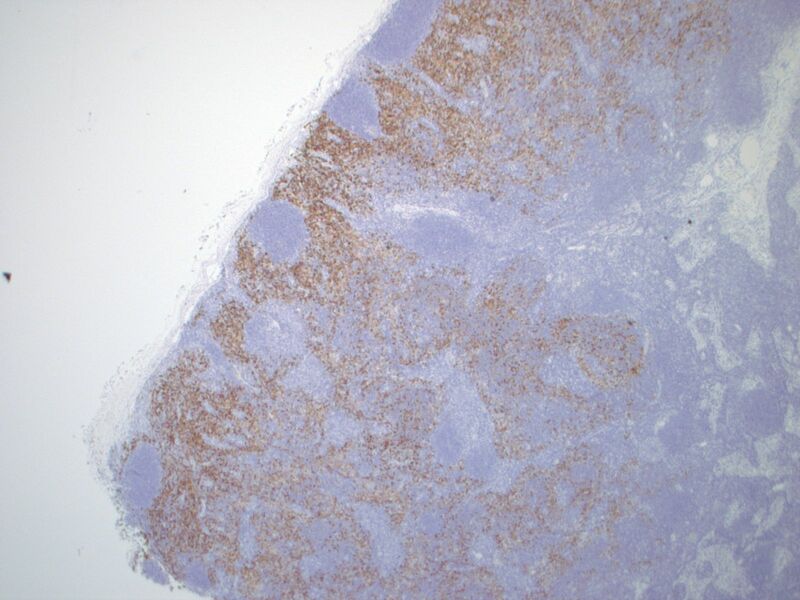 CD68 highlights the sinus histiocytosis and a few scattered histiocytes. Dermatopathic lymphadenitis (DL) is a distinct reactive pattern in lymph nodes characterized by paracortical hyperplasia of interdigitating dendritic cells (IDC), Langerhans cells (LC), macrophages containing melanin pigment and small T cells. Usually presenting as enlarged superficial lymph nodes of the axillary or inguinal regions, DL is believed to be an exaggerated response to increased antigenic stimulation in the skin. Associated skin conditions include pemphigus, psoriasis and eczema, among others. It has also been associated with a case of uremic pruritis in the setting of renal failure (Clin Nephrol 2006;66:472). Some patients do not have associated skin disease (Miranda: Atlas of Lymph Node Pathology, 2013). Males are affected more than females, and the most common age is the fifth to sixth decades. 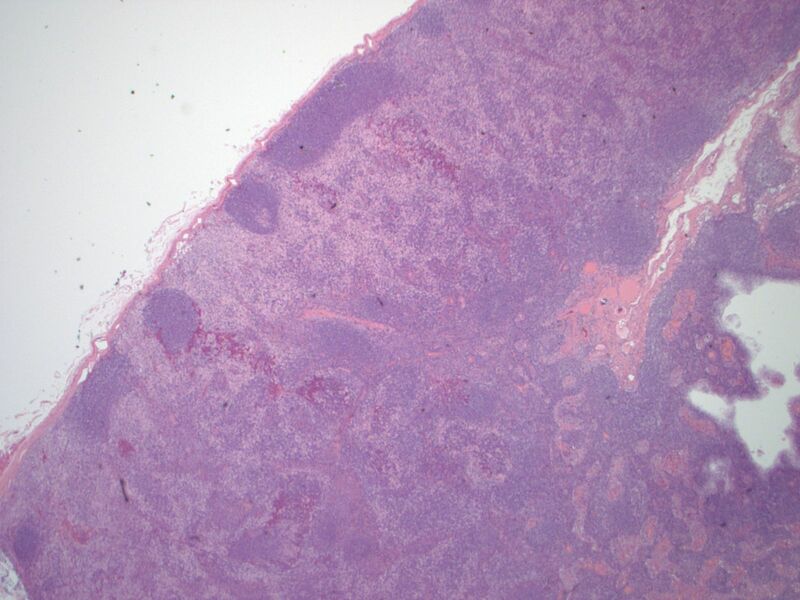 Histological examination of the lymph node reveals a mildly expanded paracortical area, particularly in the subcapsular zone. 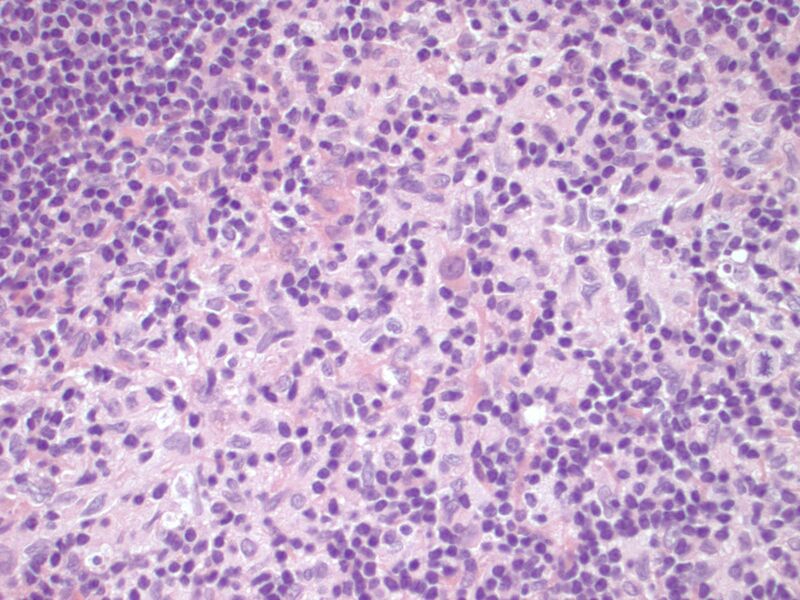 There are aggregates of polygonal and spindled cells with ample eosinophilic cytoplasm, elongated and irregularly twisted nuclei showing fine chromatin and inconspicuous nucleoli. These represent interdigitating dendritic cells (IDC) and Langerhans' cells. Accumulation of melanin pigment and lipid may also be seen (Calif Med 1967;106:170). 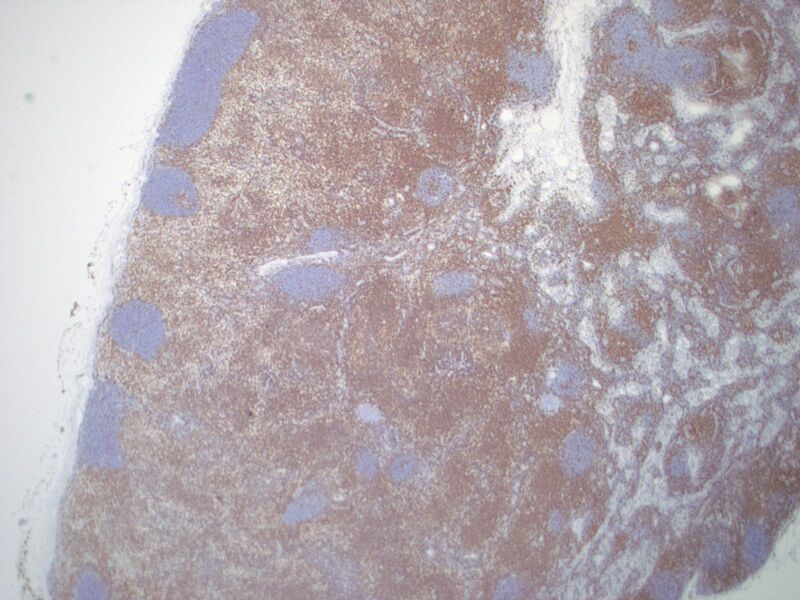 S100 stains both the IDCs and Langerhans cells, while CD1a and langerin identify the Langerhans cells only. 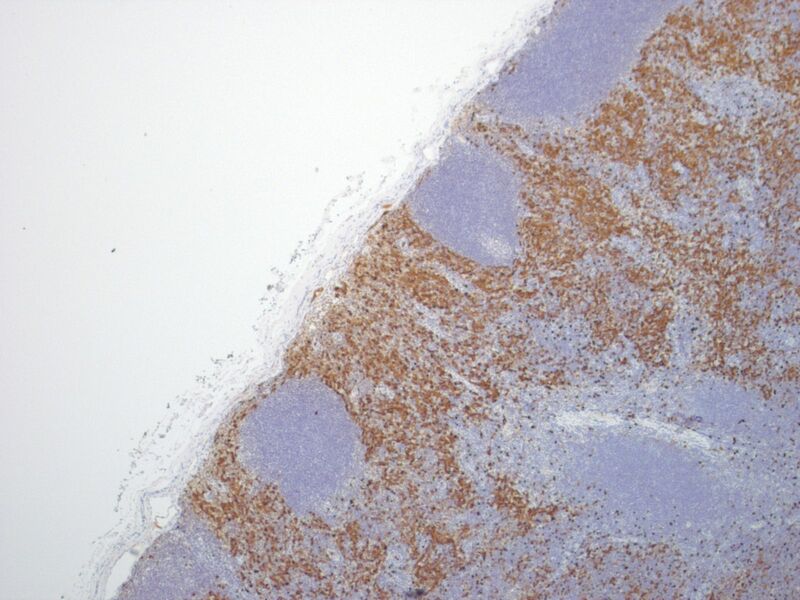 Markers of phagocytic histiocytes such as CD4, CD15, CD68 and lysozyme are usually negative in these cells; myeloperoxidase is also negative. 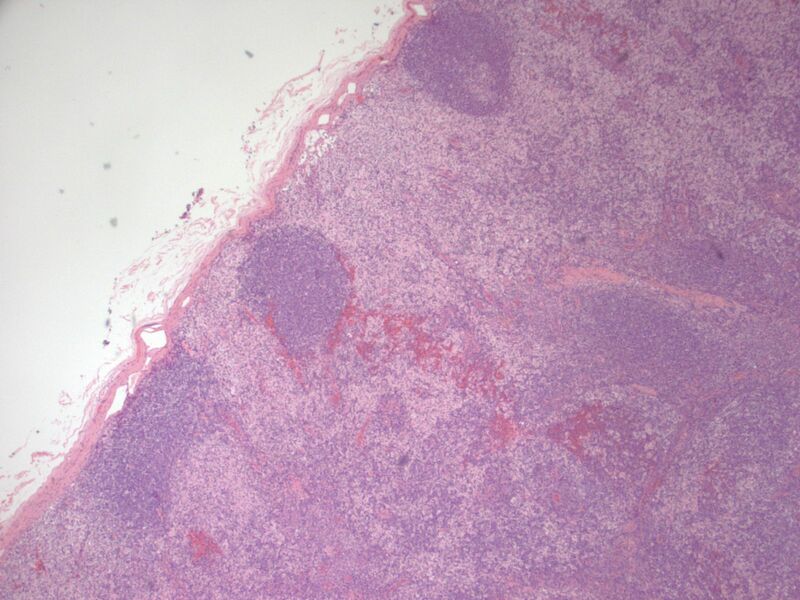 The histologic differential diagnosis includes viral lymphadenitis and classic Hodgkin lymphoma. 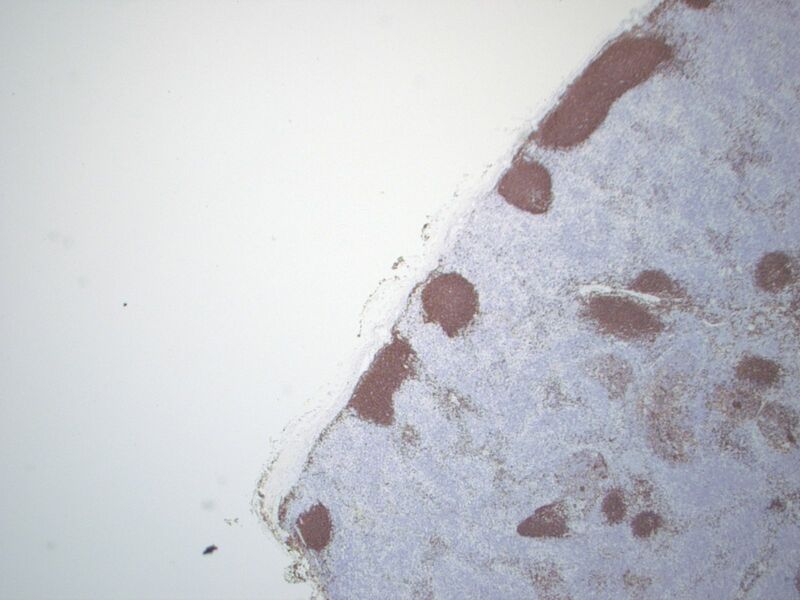 Viral lymphadenitis is usually characterized by expansion of the interfollicular area by an infiltration of small to medium sized lymphocytes (APMIS 2001;109:419). It can cause paracortical expansion, but sheets of IDCs and Langerhans cells are not present. 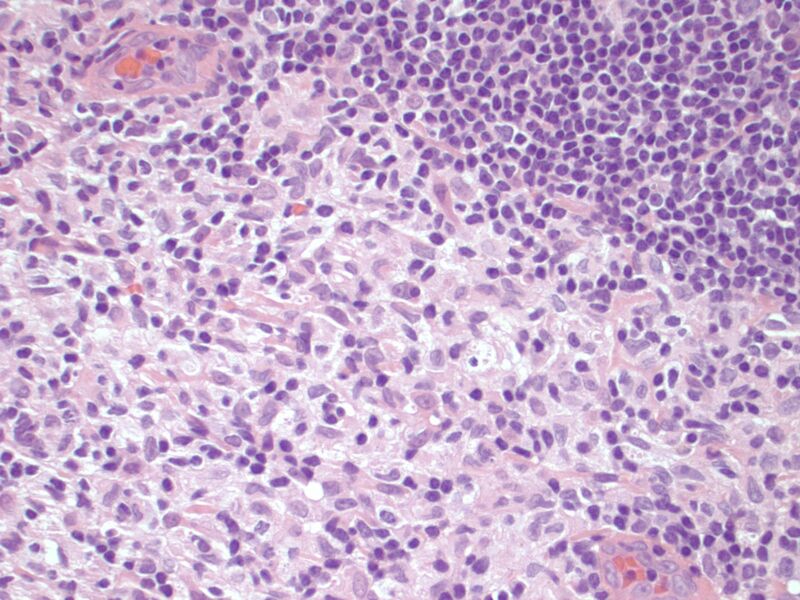 Classic Hodgkin lymphoma is characterized by multinucleated Reed-Sternberg cells of B cell origin which express CD30, CD15 and PAX5. 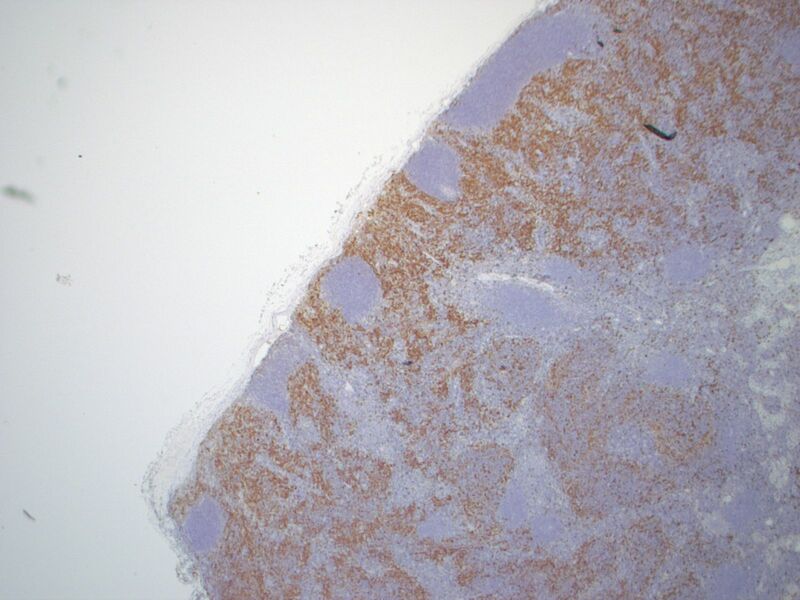 Pale staining paracortical areas due to increased phagocytic histiocytes may be seen, but IDCs and Langerhans cells are not increased. Dermatopathic lymphadenopathy is a benign, reactive condition; however, potential underlying causes should be explored. There is no specific therapy, and the lymphadenopathy resolves if the antigenic stimulation subsides (Gnepp: Diagnostic Surgical Pathology of the Head and Neck, 2009, 2nd ed).